Upgrade Your Smoothie – With My Acai Ginger Bowl Recipe! I’m sure You’ve heard of Beyonce’s “Let me upgrade you”. Well it’s time to upgrade your Smoothie! Smoothies are most often thought of as a beverage drank from a cup with a straw. But that’s not the only way to enjoy this iced fruit (and sometimes veggie) drink. It’s now being blended up thick, served in a bowl and loaded with lots of delicious toppings. Basically, the smoothie has been upgraded and it’s time you got in on this deliciously healthy movement! I first discovered Smoothie bowls on a trip to Brazil. I arrived at the hotel after a long flight, jet lagged and hungry. To my surprise when I walked into my room, instead of the typical welcome platter of chocolate or a fruit plate, there was an Acai smoothie bowl on my breakfast bar! It was a cool creamy blend of the famous super food, acai, with banana and avocado, sprinkled with freshly made granola. One bite and I was hooked! I felt amazing after eating it. Energetic, satisfied and nourished. Instead of resting, I felt good and ready to hit a light run down the stunning Rio De Janeiro beach! I’m so excited this movement has spread to North America. 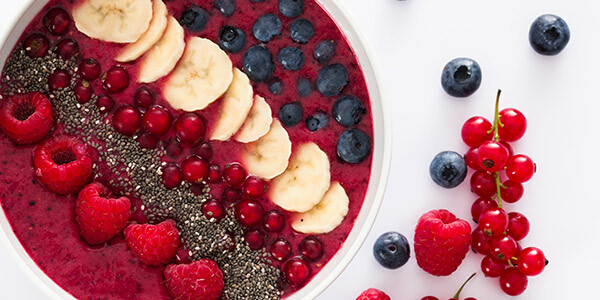 Read on to learn how to revolutionize your daily eating and wellness routine with a smoothie bowl! Whether first thing in the morning, as a healthy snack, or post workout, a smoothie bowl is a healthy alternative to ice cream or frozen yogurt. Like good old-fashioned ice cream, smoothie bowls are cold, creamy and thick enough to scoop with a spoon. But these have the added bonus of nutrient-rich fruits and veggies. Smoothie bowls are easy to prepare and becoming a power snack that ditches the conventional smoothie drink for a bowl that delivers exciting new benefits to your daily wellness regime. Fire up the blender and try out this game-changing recipe! How to build the perfect quick Smoothie bowl! Pitaya is dragon fruit and has its origin in Central America! It’s a great source of antioxidants, magnesium, fiber, active enzymes, and B vitamins. It energizes, aids digestion, supports the immune system, and, as Paloma put it, it’s very pink! Blend all the ingredients in a blender until smooth. Divide into a bowel and add, goji berries and hemp hearts. You can also enjoy it as a smoothie. If you want to try another puree, I recommend Sambazon Puree available at Natures Emporium Natural and Organic Market! Simply add all ingredients into a high speed blender until thick and creamy. The texture should be very thick, if too thick then add more almond or coconut milk. If you stick a spoon into the mixture the mixture should be able to be thick enough to stay on the spoon, if not add ice or more frozen bananas. these bowls can look like edible works of art. When it comes to toppings it’s easy to get carried away and add heaps of granola, dried fruit, shredded coconut and more. But with all that flavor comes extra calories. Be mindful about the serving size of each topping and ingredient used in the smoothie bowl. Find more delicious recipes in the Lifestyle Detox Kickstart guide available on my website!